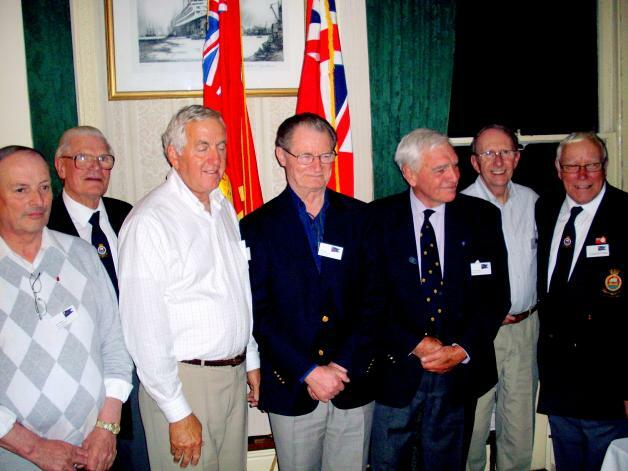 For many who attended the Grand Reunion in May, the dinner on Saturday night was a wonderful occasion. Sixty former crew and their partners enjoyed a hearty meal, fine wines and wonderful company in an atmosphere punctuated by laughter, memories and, at one point, tears . George Swaine, gave a short speech of welcome — see the video clip below. Highlights included a presentation to Fred Burney, Monarch of Bermuda veteran, on the occasion of his 91st birthday and a toast to absent friends. The toast was adapted from Joseph Conrad’s novella ‘The Narcissus — a tale of the sea’ and is reproduced below. George Swaine, former cadet then Jnr 3rd officer on Queen of Bermuda in the 1960s, a Furness Withy master and one-time managing director of Furness Withy . Finally, in the many years since we served together, we have all gone our different ways and had our own experiences – some of those who also served with us cannot be here tonight or have gone before. In Conrad’s words “A good shipmate, like any other man, is gone for ever... but at times the spring flood of memory sets with force up the dark river and on the waters of the stream, drifts a ship – a shadowy ship manned by our mates that have gone before. I hope you have a great evening – please join me in raising our glasses to our absent shipmates and the Furness Bermuda Line. Joseph Conrad, (1857—1924), master mariner. We are grateful to Cox Productions and Anthea Cox, in particular, for its use. If you have broadband, click on the play button (>) and it will run automatically but make sure you have your speakers turned on. If you are unable to see the video, it is likely that your software is not able to show the film. For best results, it should be accessed in MS XP, Vista or Windows 7. Peter Manley, John Delamere, Allen Soares, Al James, George Swaine, Bill Cox and John Meadowcroft. The video clip below includes most of those attending the dinner—you may be there !